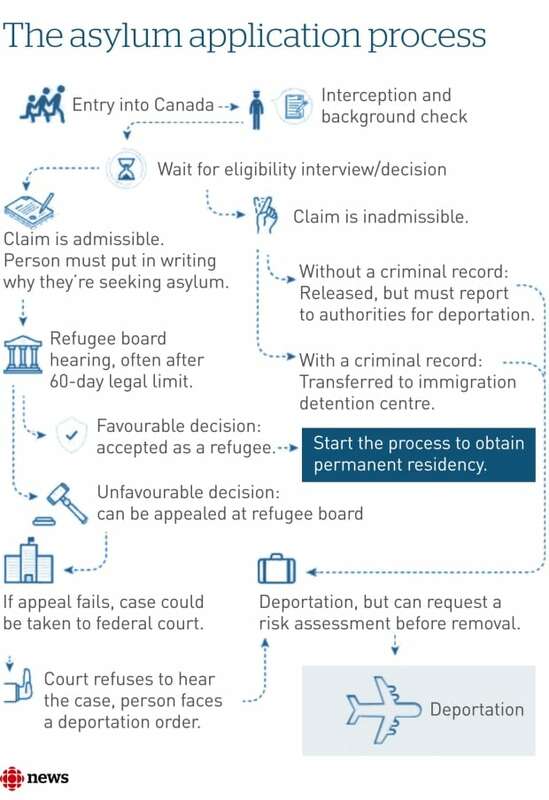 By Andrea Bellemare, CBC News | A look at how the refugee process normally works, and how its been affected by the sudden increase in demand. Asylum seekers who come to Canada are often able to make their claim for refugee status on the same day they arrive. But in Quebec the process has been disrupted by the recent influx of asylum seekers from the U.S.
Here’s a closer look at how that process normally works and how it’s been affected by the sudden increase in demand. Asylum seekers crossing the border illegally at Roxham Road are met by the RCMP, and then taken to a Canada Border Services Agency office where they fill out a Basis of Claim form. In the past, an eligibility interview would usually take place on the same day to determine if the seeker is able to proceed with their refugee claim in Canada. 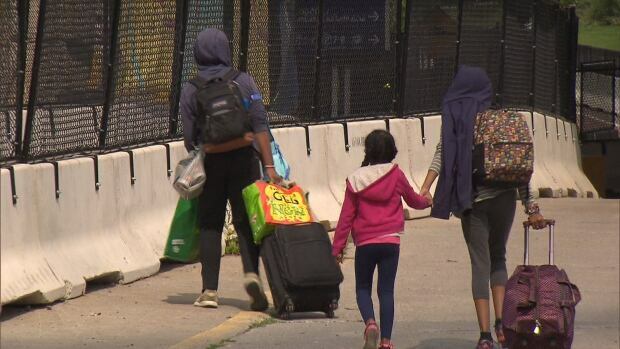 But because of the massive influx this summer, asylum seekers could have to wait up to ten months to have their eligibility interview, said Montreal immigration lawyer Stéphane Handfield. That eligibility interview is conducted by an officer from either the Canada Border Services Agency or Immigration, Refugees and Citizenship Canada. The officer’s task is to verify whether the asylum seeker meets certain basic conditions, such as not having made a claim in Canada in the past or having a criminal record. “In almost 98 per cent of files, of cases, the claim is eligible,” said Handfield. Once the claim is found to be eligible, it is referred to the Immigration and Refugee Board (IRB) for a hearing. Under normal circumstance, once a claim is determined to be eligible, a case must be heard by the IRB within 60 days. While they wait for their IRB hearing, asylum seekers have access to a range of government services. “Normally you would then be told you could do your medical and then after that, apply for a work permit,” said Rivka Augenfeld, who works with TCRI, a group of 140 social services organizations in Quebec that help refugees and immigrants. It’s not clear what government services are currently accessible to asylum seekers still waiting for their eligibility interview. 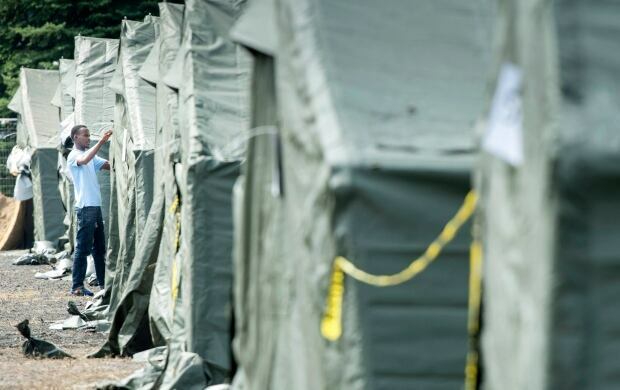 Asylum seekers are “being given, exceptionally, some health-care coverage” by the federal government, said Augenfeld. 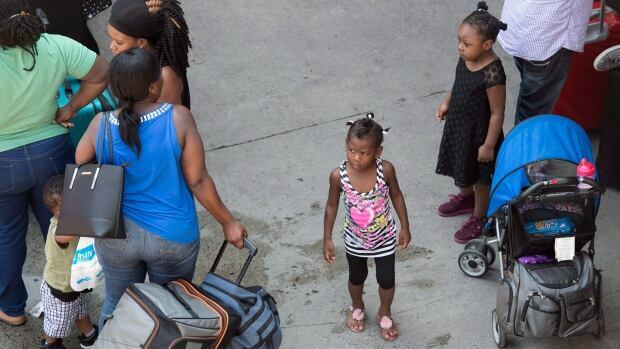 As they wait for their eligibility interviews, asylum seekers in Quebec who don’t have family to stay with are put into temporary housing and can apply for social assistance. Once they start receiving social assistance — $649 per month, per person, or $1189 for a family of four — they are encouraged to find a more permanent place to live. But with the government unable to mail cheques to many asylum seekers in temporary housing or shelters, the next round will be handed out at the Palais de congrès, Montreal’s massive convention centre. 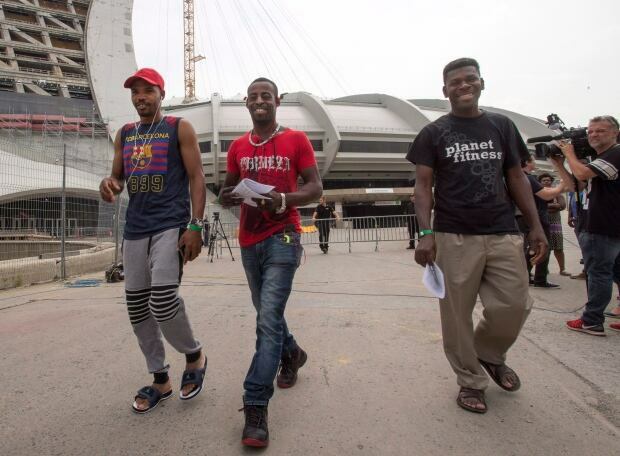 The next step for asylum seekers is to get a work permit, but that can take months. Weil has asked Ottawa to speed up that process. Parents wanting to send their children to school face the additional barrier of needing a home address to enrol their children. Montreal’s largest French-language school board, the Commission scolaire de Montréal (CSDM), said some Haitian families have signed up for school, and that it was working to ensure others who have arrived would also be able to register. When asylum seekers finally do get their hearing, they must demonstrate they face a “well-founded fear of persecution in their country of nationality” in order to receive refugee status. According to the federal government, they have to show that if they return to their country of nationality they face a risk of torture, a risk to their life, or cruel and unusual punishment or treatment. If the refugee claim is accepted, the person may start the process of obtaining permanent residency. If refugee claim is rejected, there is an opportunity to appeal to the IRB or the Federal Court, or the claimant may be deported. Handfield said many of the clients he works with are getting bad information in the U.S. about how easy it is to come to Canada. ​”The very big majority of these people are surprised when we explain to them the process they’ve embarked on,” said Handfield.